The BME280 from Bosch Sensortec is a integrated environmental sensor designed for the mobile market. It a low power consumption design that combines high linearity and high accuracy sensors for pressure, humidity and temperature. The BME280 supports either SPI or I2C interface to communicate. In this hookup guide we are using the SPI bus. Because of the small size of the sensor, the best way to use this sensor is with a breakout board. The Adafruit breakout board is used here. 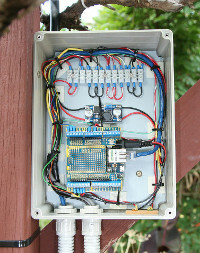 In this hookup we are only connecting one device to the Arduino using the SPI bus. It reads the barometric pressure, humidity and temperature and displays it on the console. For hookup details using the I2C bus (including sketch and library) click on this link. Sample Sketch (Download - Sketch File) Demonstrates Adafruit BME280 breakout board connected to the Arduino. The SPI bus requires 4 wires plus power and ground. We can power it using 5V or 3.3V as the breakout board has a power regulator on board to regulate it to 3.3V for the sensor. We can use 5V or 3.3V for the power supply. Just make sure you connect it to the appropriate pin on the breakout board. We can wire up SPI in two ways. We can use the SPI hardware pins which in the case of the Arduino Uno are shown below. The alternative is to emulate the SPI in software which allows us to use pins other than below. In this case we need to define what these pins are when we create the BME280 object. So in this case we can use other digital pins instead of the ones shown below. 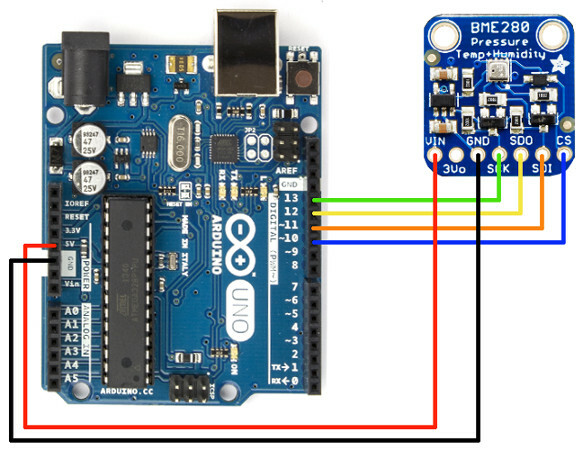 The hookup and Arduino Sketch is for connecting a single Adafruit BME280 breakout board. 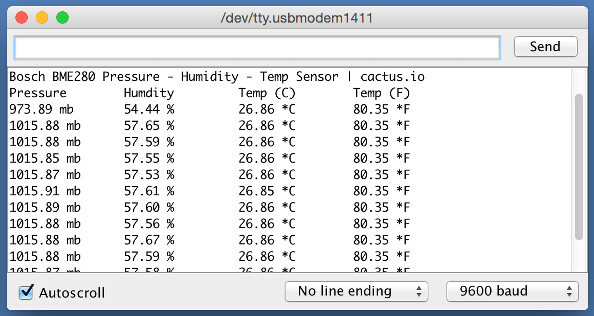 You will need to download the cactus.io BME280_SPI library to work with this sample sketch. The library supports reading the barometric pressure, humidity and temperature from the sensor. We create the BME280 object in one of two ways. The first way is if we are using the hardware SPI pins as shown above. Uncomment line 10 in the code below and comment out line 11. To use software SPI which allows us to use alternate digital pins we need to comment out line 10 and uncomment line 11. We also need to define what pins we are using. This is done in lines 4 to 7. We need to change the defines pin numbering to correspond to the SPI functions. For example if digital pin 7 is connected to CS on the breakout board we would change line 7 to #define BME280_CS from 10 to 7. To get the data from the sensor we need to call bme.readSensor(). We can then call the various functions to get the temperature, humidity and pressure. 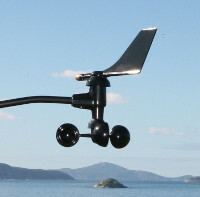 The sensor returns the temperature in degrees celsius by design. We can call the method in the BME280 library called getTemperature_C to get the celsius value or getTemperature_F for the value in fahrenheit. The barometric pressure from the sensor is returned in Pascals. 100 Pascals = 1hPa = 1 millibar. The library method getPressure_MB will return the value in millibars. When we create the BME280 object in the sketch we define the hardware pins that are used for chip select, data in and out and finally the serial clock. bme.setTempCal(-2); which will subtract 2 degrees from the temperture reading. The sketch Supports only SPI bus connection. The sketch Supports only one sensor connected. // Add a 2 second delay. delay(2000); //just here to slow down the output.